However we just kept getting a beta of 1.84. Very disappointing, no matter how we adjusted the potentiometer. I tried measuring the beta current directly (instead of measuring the resistor base voltage and figuring it out from there) and found the beta to be 33.23. Unimpressive. I understand the BJT has its own internal resistance that might have affected my readings. However, if that's the case, how can I be sure that it can deliver what it advertises, if it can't boost emitter current to a thousand times the base current? I also would want to mention that it had a base emitter voltage of roughly 0.5V instead of something close to 1.4V. Is it possible that we used a defective BJT? Some resistors across the BE junctions! Let's assume that the Vbe of the input transistor is 0.5 V (the current is quite small) then 62.5 uA will flow through R1. I don't know what the the voltage at the emitter will be but let's assume it is 7 V as a starting point, then 7 V / 51 k = 137 uA flows. Those values are very close to each other so the current through R1 cannot be ignored when measuring beta. So the base current you measure is likely not the base current of first the internal transistor. Also note the conditions stated in the datasheet for which the beta (or Hfe), with a value of 1000 is listed: for Ic = 0.5 A or 3 A and Vce = 3 V. Are you meeting those conditions? I think not due to your very large (51 kohm, is that correct or a typo?) emitter resistor. Your RE is too large to enable a practical measurement of hFE. RE = 51k gives a base current of 100nA or so. Measured VR1 = 2.1V. Measured VR2 = 1.7V. Ib = 2.1/47k = 44.7uA. Ie = 1.7/33R = 51.5mA. I dropped the supply voltage down from your +10V to +5V in order to keep the power dissipation down in R2. 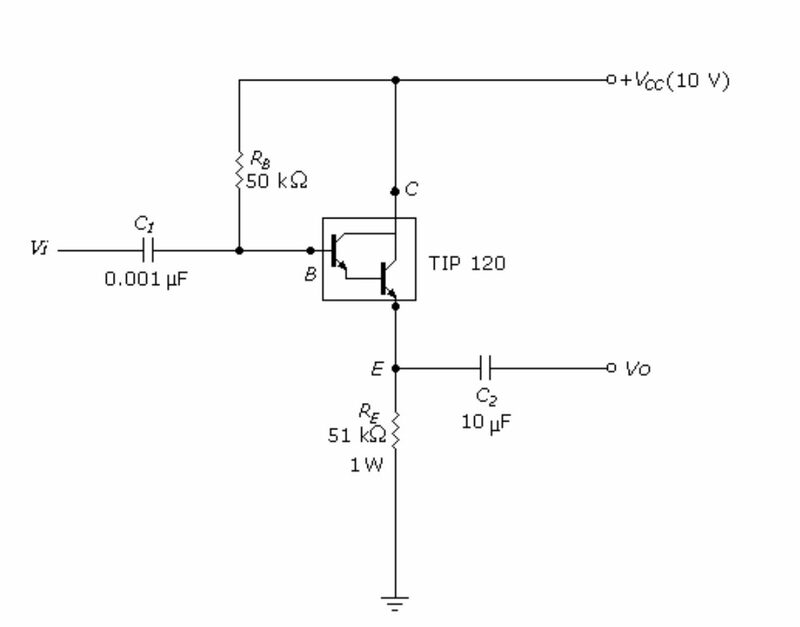 Why are you using a POWER Darlington in your circuit that uses almost no power? Use one or two low power high beta transistor(s) instead. Not the answer you're looking for? Browse other questions tagged bjt darlington or ask your own question. Where does the Maximum Emitter-Base Voltage come from? 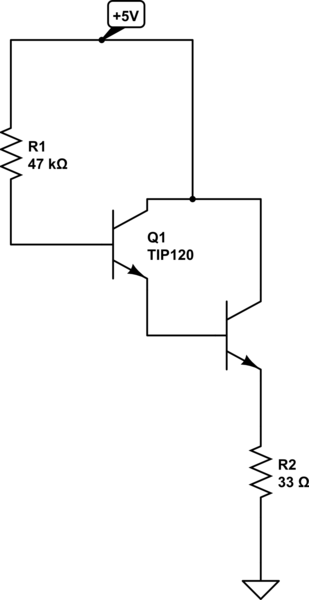 NPN BJT base->emitter resistance is effectively zero? Why does the emitter follower clip? 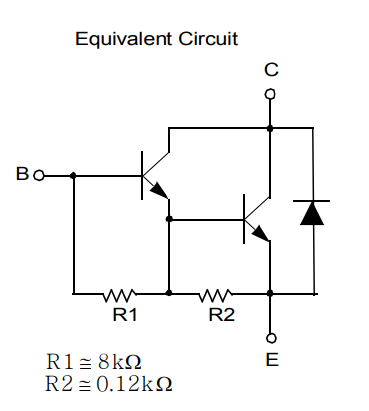 Why am I getting a weird ratio (beta) between base current and collector current? How to keep current from draining out the bottom of this push-pull amplifier? In a Wilson mirror, does Q3 need to have the same beta to cancel the base current error?